Covering the tools and techniques ethical hackers and security testers use to assess and protect computer networks, HANDS-ON ETHICAL HACKING AND NETWORK DEFENSE will help you develop the critical thinking skills and creativity essential to becoming a knowledgeable, efficient computer security professional. It’s nearly impossible to pick up a newspaper or read your favorite online news source these days without seeing yet another article about identity theft or credit card numbers being stolen from unprotected databases. Cyber crime and the threat of computer-related attacks are growing daily, and the need for security professionals who understand how attackers compromise networks is growing right along with the threat. Government agencies and private companies rely on "ethical hackers"--professional security testers--to put their networks to the test and discover vulnerabilities before attackers do. If you have an understanding of computers and networking basics and are considering becoming a security tester, HANDS-ON ETHICAL HACKING AND NETWORK DEFENSE will show you how to get started in this fascinating, growing field. 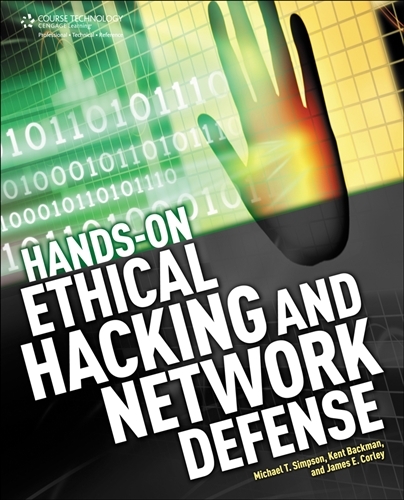 This book covers the gamut, from the legalities of ethical hacking to the details of malware, network attacks, cryptography, OS vulnerabilities, wireless network hacking, and much more. Successful security testers know their work calls for creative, critical thinking, and they enjoy the challenge of digging deep to solve complex problems. 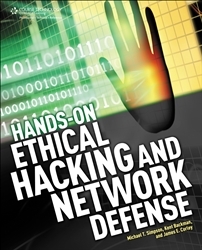 Step up to the challenge with HANDS-ON ETHICAL HACKING AND NETWORK DEFENSE.